Our new Firestorm Galaxy storyline started in 2014 when we launched Planetfall, our 10mm true-scale ground warfare game. The story introduced us to the planet of Proteus Prime, a mysterious and until then hidden world which held a dark secret which had been kept by the Aquan Prime and Tarakians for generations. 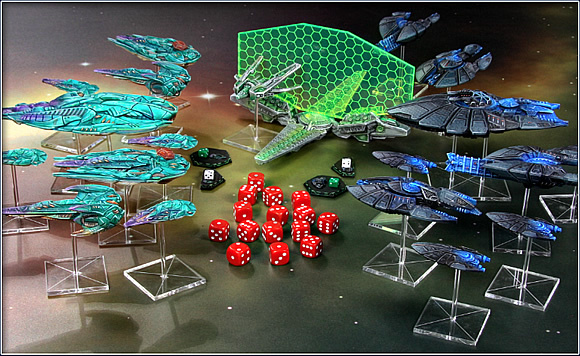 In 2015 the exciting story took its next step with the Return of the Overseers 2-player set, an expansion to the Firestorm Armada space combat game. Both sets bring together the forces of the Aquan Prime and Directorate as they battle on and above Proteus Prime, igniting a new phase of warfare in the Firestorm Galaxy. The planet holds the secret of a race called the Overseers, a once dominant force in the galaxy which controlled the ancient races – Aquans, Sorylians and Tarakians. When the Overseers vanished from the Firestorm Galaxy, the Aquans and Tarakians exacted a violent revenge on the Saurians, creating a time known simply as the Desolation in the history of both races. The Aquans, being an empathic and telepathic group of species, were utterly traumatised by their conduct of the war and the atrocities they committed in the name of ‘liberation’. The ruling Cserani therefore undertook an extraordinary act – they took it upon themselves to shoulder the burden of guilt for their entire dominion and the races under their guidance. Preserving the truth as part of their collective consciousness, the ‘Great Mind’ of the Aquan Sebrutan fabricated the ‘Weave of the Great Dreaming’ – a sanitised history of the Sebrutan’s development impressed into the collective consciousness of all Aquan sub-species. Following the slaughter of the outlying Saurian systems the Tarakians chose to withdraw to their home systems within the Harrison Belt to keep their own counsel – the truth of their participation buried in the deepest vaults of their citadels, their Loremasters sworn to secrecy. Tarakian legacy was to become the ‘Watchmen of the Stars’, hunting down pirates, raiders and other oppressors of peaceful peoples, all the while hiding the great darkness in their own past. The unspoken Watchmen role, however, is to keep careful watch in case the Overseers should ever return or the Saurians rise again. As we move towards the arrival of the new Firestorm Armada 3.0 and Planetfall 2.0 rules we are recruiting new commanders to help fight the conflict and what better place to start than the planet of Proteus Prime and our 2-player starter sets. Grab the Proteus Prime 2-player set for only £60 (save £20). Grab the Return of the Overseers 2-player set for only £60 (save £30). 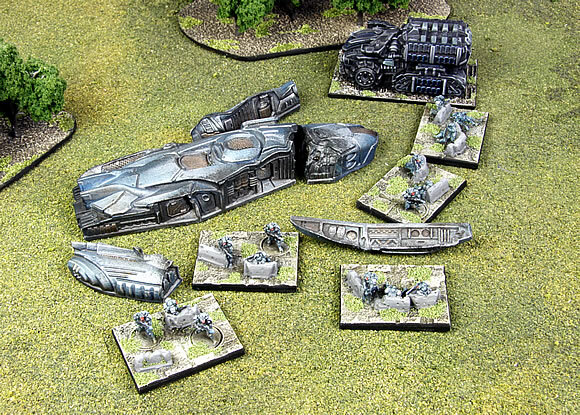 The impressive array of models that can be found inside our Return of the Overseers starter set. Watch out for our Firestorm Armada Galaxy Expansion Kickstarter which continues the exciting story of the Overseers as the Saurian Dominion makes its return to the galaxy and a horrific old faction, the Pathogen, comes out of its self-imposed exile to wreak havoc across the galaxy. We’ve also got a raft of Core race expansion models, new books which take the Firestorm narrative to a whole new level and much, much more. The Kickstarter will have something for everyone, so check it out. Time to enter the war commanders… your Firestorm races need you! Head over to our Online Store and grab your deals now!